China is working fast. BYD began sales of the BYD F3DM plug-in hybrid on December 15, 2008. This occurred days after Washington and Beijing announced plans to work together on green car technology: China’s Science & Technology Ministry signed an agreement with the U.S. Energy Dept. to collaborate on battery technology to power cars on Dec. 11. 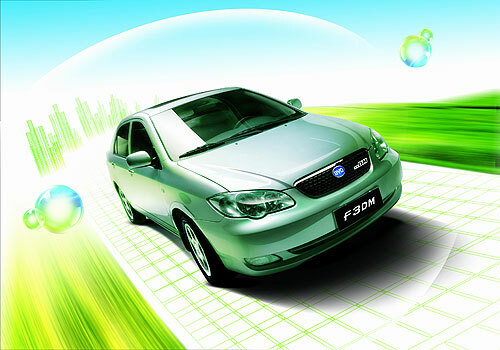 The BYD F3DM is a Camry clone on the exterior, but inside the car utilizes BYD’s advanced ferrous battery technology. The F3DM can drive 100 kilometers (62 miles) on a charge, shifting to gasoline when the battery runs low. The car will be able to reach a top speded of 100 mph with a 0-60 mph time of 10.5 seconds. BYD claims their Dual Mode is different from a range extended electric vehicle because it actually has three modes of operation: 1) Full battery-powered electric mode 2) Series-hybrid mode, in which an engine drives a generator to recharge the batteries, acting as a range-extender like in the Chevy Volt. 3) Parallel hybrid mode, in which the engine and motor both provide propulsive power, like in the Toyota Prius. Full recharging takes about seven hours in a traditional outlet or one hour at the company’s charging stations. Ten minutes in a traditional outlet gives the battery a 50 percent charge, according to BYD. That is pretty unbelievable though. Everyone makes the claim of a ten minute recharge; most likely this will need a high output charging station. The BYD F3DM is priced at $22,000 and will hopefully be available in the US by 2011. BYD’s first F3DM sale was an order of 50 cars for the Shenzhen municipal government and China Construction Bank as part of the company’s strategy of selling to corporate buyers first, then mass market the vehicles in China the second half of 2009. This can change everything, hope it works out well for the company.